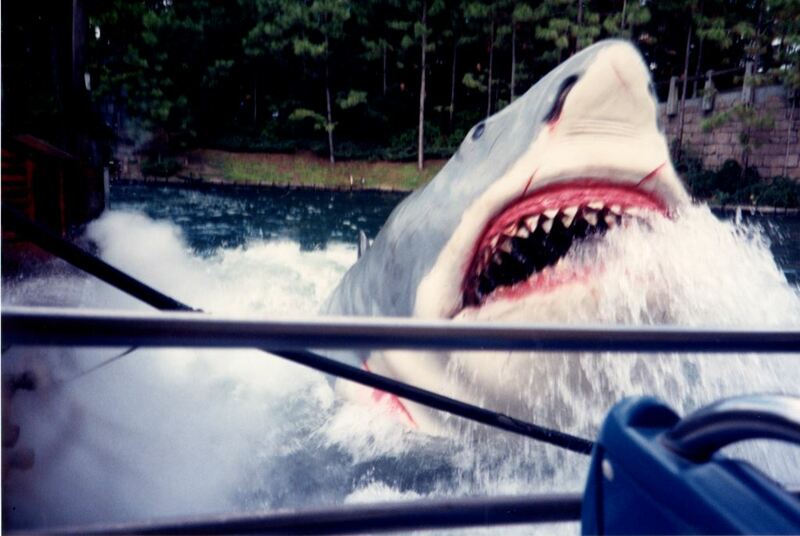 The Jaws ride at Universal Studios Florida, located at 6000 Universal Boulevard in Orlando, Florida, in 1991. Universal Studios Florida, a movie- and television-themed amusement park, opened on June 7,1990. Design began in 1982, with plans to include a working studio. However, the project was put on hold until 1986. The park originally featured several themed areas: "In Production" (Front Lot and Production Central), "Now Shooting" (New York), "On Location" (San Francisco and Amity), and "The World of CineMagic Center" (Expo Center). 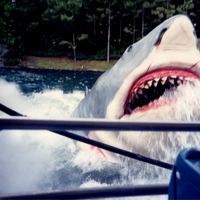 This ride is based on the film Jaws and opened the same date as the park. Jaws and the Amity area of the park permanently closed on January 2, 2012, in order to make room for Diagon Alley, an area based on the Harry Potter film series. Original color photograph, 1991: Private Collection of Nancy Lynn Cepero. Digital reproduction of original color photograph, 1991. "Universal Studios Florida." Universal Studios Florida. https://www.universalorlando.com/Theme_Parks/Universal_Studios_Orlando/universal_studios_florida.aspx. “Jaws at Universal Studios Florida, 1991.” RICHES of Central Florida accessed April 25, 2019, https://richesmi.cah.ucf.edu/omeka/items/show/4485.